I am a proud member both of The Magic Circle and of Equity. But what are they and what does my membership mean to you? Many people have heard of The Magic Circle but aren’t quite sure what it is … or even if it really exists! It’s one of the questions that I get asked most often. So, here’s a brief overview for the curious. 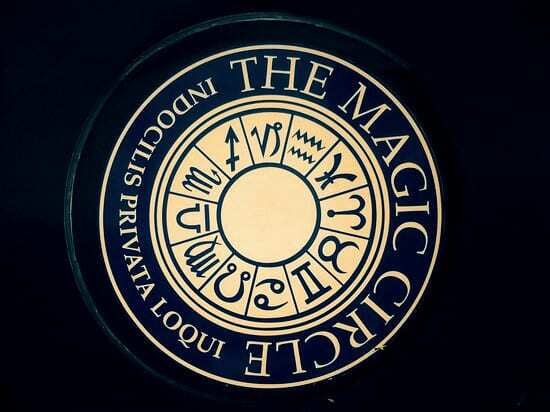 The Magic Circle was founded in 1905. It is the world’s most prestigious magic society and is dedicated to promoting and advancing the art of magic. Although a British society, it has a membership of approximately 1,500 magicians from all around the world, including some of the world’s most accomplished magicians; from Dynamo to David Copperfield. The Magic Circle’s membership meet at the society’s headquarters in Euston, London. Here they can attend lectures from visiting guest magicians, utilise the vast magic libraries, visit the museum or work on their acts with other like-minded magicians in the clubroom. The door of The Magic Circle’s London headquarters. 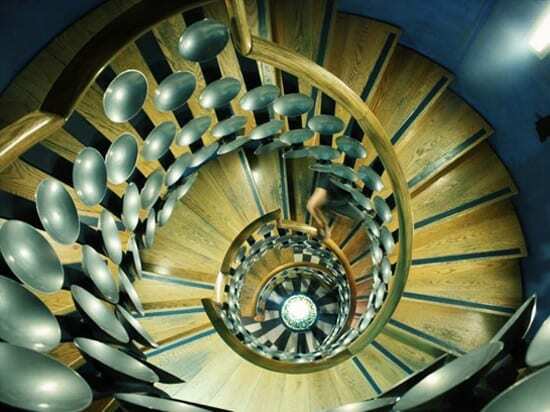 The beautiful internal staircase at The Magic Circle. Membership of The Magic Circle is a real milestone in the careers of many magicians and the membership process is far from easy. First, the magician will attend an interview at The Magic Circle Headquarters to ensure that his or her skills and knowledge are appropriate for the more formal examination (audition). At the audition, the magician will perform a six to eight-minute magical presentation in front of an audience of magicians and a panel of judges. The performance is marked against a rigorous set of criteria revolving around technical ability and presentation skills. If the magician can demonstrate good competency to the judges, he or she will be recommended to the ruling Council of The Magic Circle for membership to be ratified. It’s only after that point that the magician can use the title “Member of The Magic Circle” and use the initials M.M.C. after their name. Gaining membership to The Magic Circle is often just the first step for many members, as there are actually THREE degrees of membership. The magician can opt to undertake a further, more rigorous performance examination, which is assessed under far stricter criteria. If successful, the magician will then be able to use the title Associate of The Inner Magic Circle (A.I.M.C). A.I.M.C is as far as it’s possible to progress by ability alone and this is the degree that I was proud to be awarded in 2007. The final level is that of Member of The Inner Magic Circle (M.I.M.C) which is limited to three-hundred members at any one time. This is awarded to members who are deemed by the council to have performed a great service to the art of magic. It is considered a great honour to receive this degree. The Magic Circle Stage Magician of The Year. These awards are both decided by the result of two annual competitions; entries for which are invited from the 1,500 magicians comprising the organisation’s entire membership. 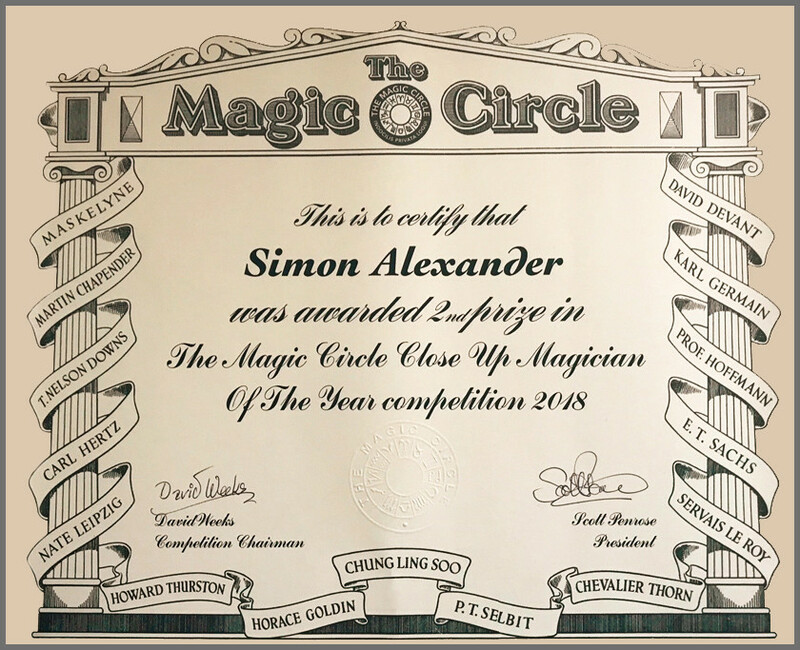 I competed in The Magic Circle Close-Up Magician of The Year for the first and only time in 2018 and I was delighted to achieve second place. The Magic Circle Close-Up Magician of The Year Certificate. Equity used to be known simply as “The Actors’ Union”. Nowadays it represents a broad range of more than 43,000 performers and creatives including, of course, magicians. Being a member of Equity comes with many benefits to the performer but, to you as a client, it means that the person you’re hiring is a bona fide professional with £10 million public liability insurance and top level legal representation should anything go seriously wrong during his or her act. Contemplating what might go wrong is the last thing you want to be doing when you’re organising an exciting event. But by hiring an Equity Member, you don’t have to. You’ll have the peace of mind of knowing that everything is covered.